Feeling the winter chill? Now is the time to get your home’s heating sorted – before it gets put on the, erm, backburner for yet another year! The right heating for your home depends on its size, level of insulation and, of course, your budget. We’ve distilled the options for you: gas, electric or woodfire? Radiant or convection heat, or a combination of the two? Read on to discover the benefits of the different systems and what to look for in each. This is your first step in narrowing down the hot options. Electric heating – including fan heaters, oil-filled column heaters, and bar radiators – is suited to smaller rooms that can be closed off from the rest of the house. “An electric heater is more a room warmer or personal heater”. A reverse-cycle air conditioner is another effective option, using as little as one-third of the energy of other electric heating. Gas heating is considered the best solution for large or open-plan spaces; it heats up bigger areas in a shorter amount of time. Although a gas heater initially costs more, it’s cheaper to run and will create more heat while emitting less greenhouse gases than fossil fuel-run electric heaters. Gas heaters also carry star ratings – the more stars, the more energy-efficient they are. A gas heater can be portable, ducted (with air vents in the walls or ceiling) or mounted on the wall. If you don’t have a gas connection, you can purchase gas by the cylinder; just ensure that you factor this in when you buy your heater, as cylinders require different fittings to natural gas heaters. If you’re in need of instant heat in a small area, consider a portable radiant or convection heater; these come in gas and electric options. Radiant heaters, such as bar radiators, are hot to the touch and radiate that heat. While a radiant heater will warm you up if you sit next to it, they’re not always powerful enough to heat a large room. Convection heaters, such as fan heaters, heat and recirculate air convection currents through the appliance. They use more energy but will fill the room quickly with warm air. As the surfaces don’t get very hot, they are well suited to households with small children. Combination heaters combine the two types of heat – for example, radiant convection heaters can be used on either setting, depending on whether you want the fan turned on for extra warmth. Ceramic heaters are relatively new to the market; electricity passes through a ceramic plate, heating the room around it. Unlike other electric heaters, ceramic heating produces less heat as the room warms up, making it a more energy-efficient electric option. An oil column heater is the safer option if heating any space that will be left unattended – choose a model with a timer (or simply buy a plug on a timer) to ensure it only turns on when you need it. Central and under-floor heating work on a much larger scale. If you live in an icy climate or have a large home, ducted air conditioning might be your best option, where one central unit supplies heat to every room of your home via vents in the ceiling or floor. If you’re investing in this kind of heating, zoning (dividing your home into zones, so some can be heated while others are shut off) is a must. Under-floor heating will also help save on energy bills, as surfaces stay warmer for longer. If you’ve always dreamed of a fireplace, you can still achieve the look without an air-polluting chimney – good news for city dwellers. Gas log heaters provide the ambience of a real wood fire without the work or the smoke. 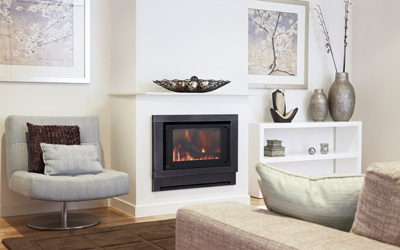 Electric fireplaces plug into an outlet and can be freestanding or integrated into a mantle.